Relativity Server is installed as part of Data Abstract to your local system. On Windows that would typically be C:\Program Files\RemObjects Software\Data Abstract (Common)\Bin and on Mac OS X that would be in the /Applications. To start Relativity, you need to either execute Relativity.exe on Windows or Relativity.app on Mac OS X. When run it will be available on the localhost at port 7099 serving the PCTrade 2.0 and Simple sample domains used by the sample applications also installed as part of Data Abstract. When Relativity is run on Windows as a desktop application then it appears as a window on the desktop and as an icon in the taskbar. Right clicking on the taskbar icon provides some basic commands as shown below. 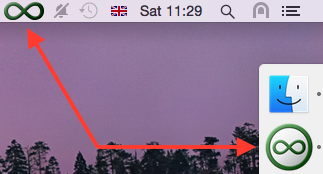 When run on Mac OS X, it appears as an icon on the OS X Dock and in the menu bar as you can see in the picture below. Clicking on the menu bar icon also provides some basic operations including a shortcut to open web interface. On Windows right click on the taskbar icon and select "Stop Server"
On Mac OS X left click on the menu bar icon and select "Pause Server", or click on the dock icon and then Server->Pause Server from the menu. On Windows right click on the taskbar icon and select "Shutdown" or click on "X" of the Relativity Server window. On Mac OS X left click on the menu bar icon and select "Quit Relativity", or click on the dock icon and then Relativity->Quit Relativity from the menu.